LANSING — A state representative who sponsored an amendment that would have benefited the ride-sharing company Uber worked for Uber as a driver while also serving in the Legislature. Term limits forced now former Rep. Pat Somerville, a Republican from New Boston, out of office at the end of 2016. 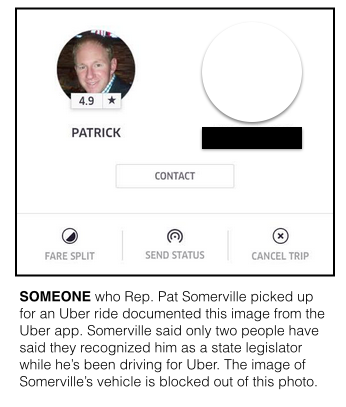 But during the 2015-2016 session, Somerville voted twice in favor of a package of bills that set state requirements for ride-sharing companies like Uber and Lyft. Uber and Lyft are businesses based around pairing people who are looking for rides with people willing to drive in order to make money. Before the Michigan House first voted on the bills in the summer of 2015, Somerville sponsored an amendment that specifically prohibited airports from outlawing Uber, Lyft and similar services from picking up and dropping off passengers. The House adopted the amendment, but when the bills moved to the Senate, the Senate changed the language. In an interview last week, Somerville said he’s been driving for Uber on the side in addition to his legislative duties since the beginning of 2015. 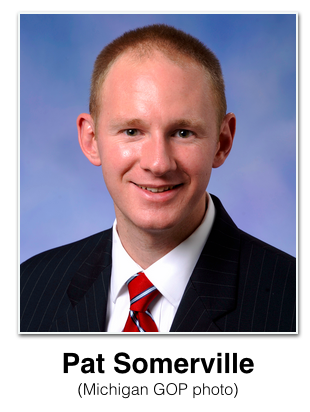 Somerville said he primarily drove for Uber on weekends and on University of Michigan game days in Ann Arbor. “I didn’t think I was doing it enough to make it a conflict,” he said when asked if his work was a conflict of interest. Somerville also said the legislation wasn’t specific to him and noted there are thousands of Uber drivers around the state. As for the airport amendment, he said the airport where Uber drivers had been having major problems was in the Grand Rapids area in West Michigan, not in Wayne County, his area of the state. Michigan has no law that bans state legislators from voting on bills in which they have potential conflicts of interest. Unlike the Senate, the Michigan House doesn’t even have a rule against lawmakers voting when there are conflicts of interest. The House rules simply provide the option for members to not vote and to state in the official House record that they didn’t vote because of a conflict. An October 2016 investigation from Bridge Magazine and the Michigan Campaign Finance Network found that the number of lawmakers voluntarily not voting on bills because of potential conflicts has been decreasing over the years. The investigation also found that lawmakers often spearheaded bills that impacted their career fields outside the Legislature. According to Crain’s Detroit Business, airports in Michigan had been worried that the legislation would impact their ability to set rules and set an access fee for passenger pick-ups. While Michigan has a full-time Legislature, some lawmakers work other jobs on the side. Most Michigan House members made $71,685 a year in 2016, according to the House’s employee salary disclosure. Asked why a representative would need to work for Uber on the side, Somerville said House members are term limited after six years and then face potential unemployment. If he wanted to make money in his personal time on the side, he should have been able to, said Somerville, who now works on the House Republican staff.